Partnering to restore key habitat and connections through Victoria’s central uplands. Melbourne is an initiative of Biolinks Alliance member groups around the northern, greater Melbourne region stretching from Brisbane Ranges to the west, through to the Upper Goulburn River catchment in the east. Groups in this region have met Biolinks Alliance workshops and identified issues, ecological assets and demographics similar across their region. The notion of sharing ideas, skills and expertise throughout this area was born. 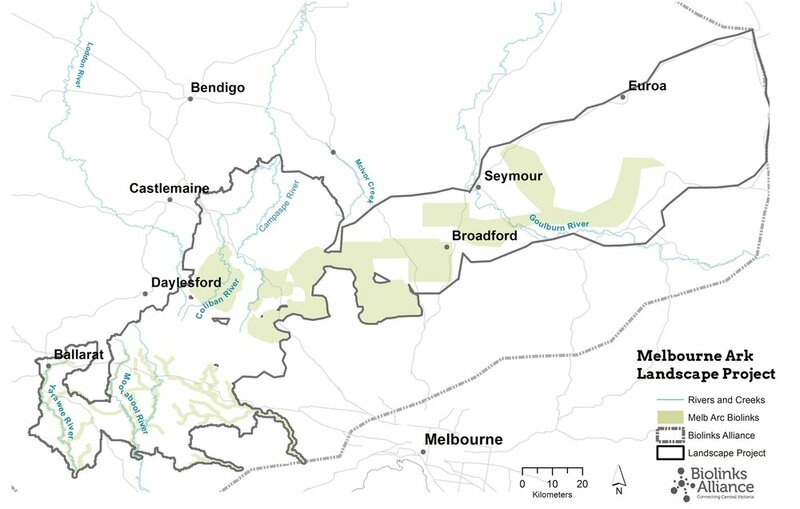 Melbourne Ark straddles four Catchment Management Authority Boundaries and 6 Municipal Authorities, as such, groups here have not had the opportunity to work closely together in a formal sense. The region forms a key connector between the majestic Grampians at the southern-most point of the Great Eastern Ranges and the highly biodiverse, carbon rich and culturally important tall forests of the Victorian Central Highlands. Being part of the Great Eastern Ranges the area will play a vital role in helping to reduce the impact of climate change through providing critical refuge areas for many native species and enable them to move and adapt to a warming climate. This landscape is under pressure with an expanding Melbourne population encroaching from the south and climate change causing a shift in enviromental conditions southward and upslope from the increasingly arid north. Deliver integrated community engagement and on-ground conservation activities across priority regions with BAs member community groups. Activities will be tailored according to groups’ capacity, interests and priorities relevant to their local landscapes. Melbourne Ark is a flagship project that aims to draw in the relatively high population of people to achieve landscape change that is needed for wildlife to adapt to climate change and for the ranges to remain productive and beautiful for nature and people alike. Projects underway in the Melbourne Ark are focusing on glider species - to find out more see Glideways in the Melbourne Ark.